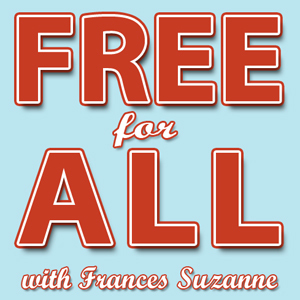 The amazing sisters, Emily and Ashley from FrancesSuzanne, are back with a new Flip this Pattern Series: February “Free for All” is currently displaying free sewing patterns for all of us, sewing-lovers. I must confess that my will-power is close to nothing when it comes to testing a new pattern (either free or purchased), so I was obviously I was so happy to join the challenge. I had done it before (here), but because I used a faux furry remnant from a local I skipped a few steps from the original pattern: I did not used 3 layers and didn’t add the lovely quilted cap sleeves. The pattern is written in French, but don’t let this prevent you from using it. There are step-by-step instructions and it’s such a simple project (the sizes run from 3/6 months to 6 years). 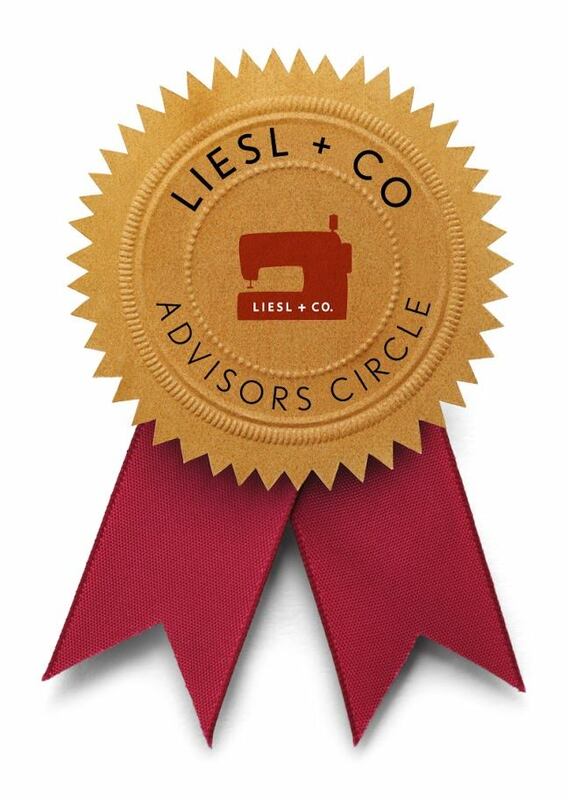 The pattern calls for three layers of fabric: knit/jersey for the outside, polar fleece/batting for insulating and cotton for the inside/lining. 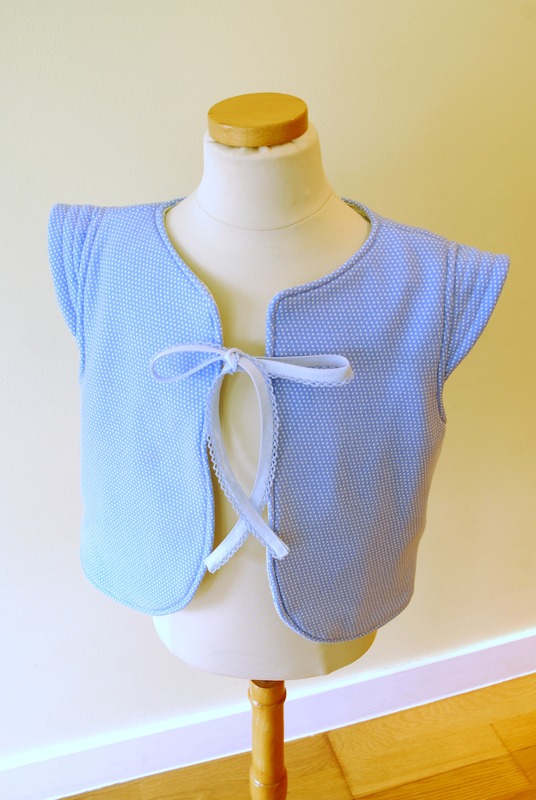 You end up with a reversible vest with the most adorable quilted cap sleeves. I used a crocheted bias trim from my stash for the ties, but this would look equally nice sans ties or with a bow-type sort of ties. For this version, I used a basic fabric combo: tiny blue dots knit from the much-loved collection (City Weekend by Liesl Gibson), a tiny blue/green floral cotton from Hilco (remnant from a O+S Hopscotch skirt) and polar fleece as the intermediate layer. The only mod I made to the original pattern was adding a few inches to the length. This is such a quick project – you can easily finished it in one-hour – that I’m sure you’ll be addicted as well. Thank you so much for having me, Emily and Ashley! Adoro este molde! ❤ fica sempre bem e as tuas versões são uma delicia!!!! I love it Ana Sofia!. 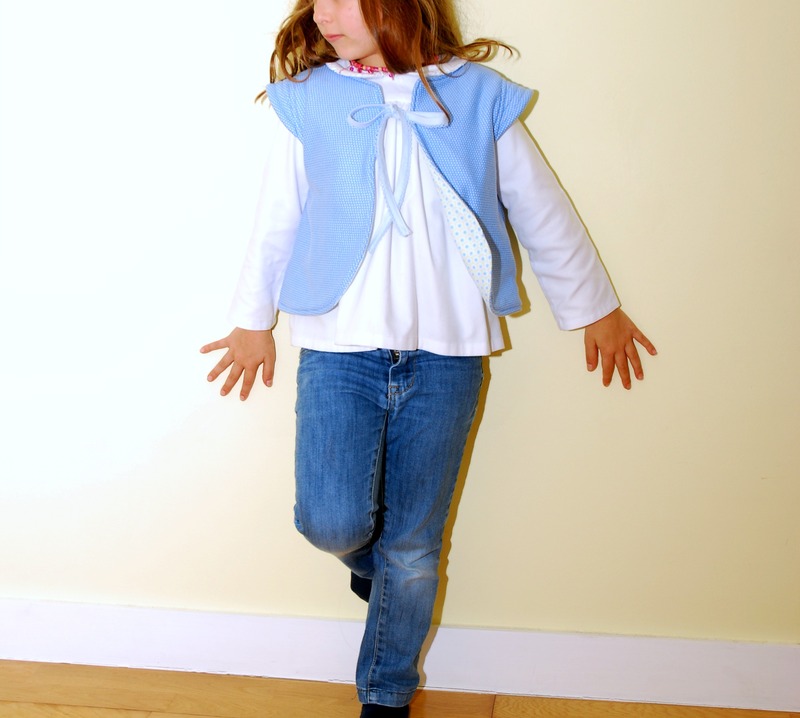 you know I did download the pattern months ago because I think is gorgeous and I wanted to make one for my daughter. Now that I see yours, I totally need to have a go. Beautiful job. Ficou ma-ra-vi-lho-so! Tão, mas tão bonito! A escolha de tecidos é fantástica. Ficou tão giro! Já tenho esta pattern e agora, depois de ver o teu colete, tenho mesmo que arranjar tempo para a usar. É mesmo um molde rápido – faz-se num abrir e fechar de olhos, e segundo fui “informada” está na super na moda! Cest vraiment tres joli! Très simple mais tellement chic! Such a gorgeous vest 🙂 Thank you for sharing! Oh deadlines at work… They spoil all the fun, hey? You are the queen of trims!! CUTE addition to a cute vest!! Eu não sou moça de coletes, mas este, com a tua escolha de tecidos fez-me desejar fazer um para a miúda… será?! Está lindo Ana Sofia!!! A Lovely vest. 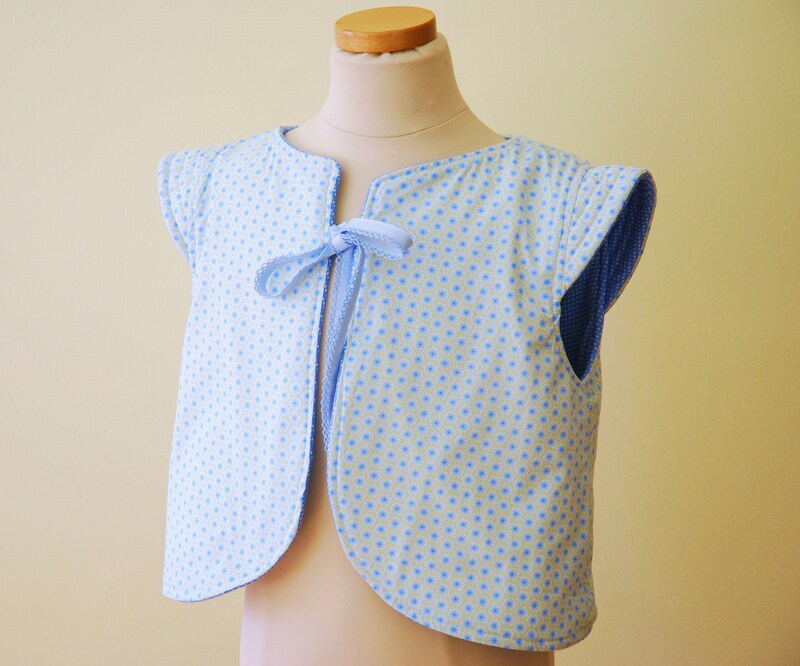 My girls have just been falling out over the only 2 vests we have so I think I will have to try this pattern.